If you enjoy hearing Dr. S.M. Davis speak, and you can play Audio MP3’s, then this product is, without a doubt, the best deal that we have available in Audio version. 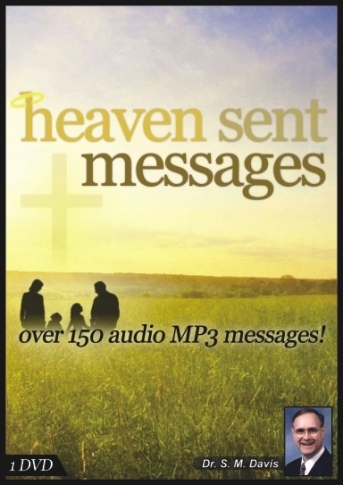 Some ministries sell Dr. Davis’ audio messages for $8.00 a piece. At that cost, the value of this DVD would be $1,200.00! Our MP3 DVD is ONLY data files that can be downloaded to your computer for playback there or on a MP3 player. MP3 FILES ARE AUDIO ONLY, NOT VIDEO. Permission is only granted for personal use and not for distribution. There are 150+ messages on this MP3 DVD. 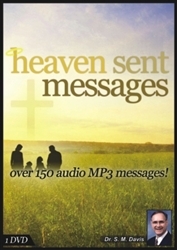 Virtually every major message in the Solve Family Problems Ministry is on this 1 MP3 DVD. You'll also receive messages that are not available in our regular catalog or on-line. DISCOUNTS WILL HAPPEN IN THE SHOPPING CART AS YOU CHECK OUT. Can You be Saved from All Your Sin All at Once? Dr. Doug Hammett: Are You a Vegetable, Animal or Human? Dr. Ralph Stewart: Evolution: Fact or Fairy Tale? Should Christians Choose Burial or Cremation? Why Should I get the visual DVD instead of the audio CD version? What is the importance of the visual DVD vs. the audio CD version? The question that you want to ask yourself when trying to decide between purchasing the visual DVDs or the audio MP3 or CDs is: Am I dealing with a problem in this area? (Anger, Sibling Rivalry, Marriage etc.) If you're dealing with a known problem or if this is something that you would want your children to listen to then you will want to get the DVDs. If this is something that you are just interested in listening to that you don’t see that you are having a problem with then the audio version will be fine for you. Audio MP3s or CDs GIVE INFORMATION. Visual DVDs MAKE AN IMPACT! A weeping Mother gave this testimony: Please tell everyone to listen to you when you tell them that the visual DVDs really do make a difference! We thought we were doing a good thing when our daughter wanted us to purchase all of Dr. Davis’ audio cassette tapes. We didn’t see the necessity at the time of the videos and didn’t feel the need to spend the little extra, so we just purchased the audio version of the cassette tapes. I was calling for counsel not 2 months later because our daughter had left home and had ‘gone off the deep end.’ We didn’t know what to do so we called Dr. Davis’ ministry for counsel and sadly they had to tell us that she had missed the impact that the Visual had to offer and there is probably a slim to no chance that she would now come back and listen to the visual DVDs that she needed to help her since she had already listened to the cassette tapes in the audio format. The audio version ended up hurting us much more than helping us. It inoculated our daughter just enough for her to not be able to foresee the areas where Satan was working against her in her life and help her be able to change before it was too late. We, as the parents, did not even realize that we weren’t impacted enough by the audio version to make the changes that were needed in us until it was too late. Please tell others our story to save them more heartache! The visual DVDs give the impact that you need made on you personally to help you recognize a problem and be able to get victory over it. The audio version is not likely to give you that impact! It would be better for you to not hear the sermon at all than to get just enough to inoculate yourself or your child against dealing with the problem. If you truly want victory in this or any area for yourself or your child, you will NEED the visual and NOT the audio version. If you can't purchase everything you need at one time, we suggest that you start with the most needed first. (See our specials for the BEST possible price.) We are doing our best to try to help you deal with the problem you’re having and truly solve it once and for all. On our DVD, “Anger, the Destroyer” Dr. Davis gives an analogy of anger and how that, “an angry Father is like a fire breathing dragon.” So, not only do you hear him state that phrase, but the full color picture of a fire breathing dragon comes up on the screen. The next time you find yourself becoming angry with your child, the picture of that “FIRE BREATHING DRAGON” pops into your mind and then helps you to realize that you at that moment are becoming a “FIRE BREATHING DRAGON.” The mental pictures help you to be able to DEAL with the problem. You completely miss that picture analogy if you are just listening to the message instead of watching it. Quick, easy, cheap fixes of any life problem tend not to last. This is even truer in the spiritual realm than in the physical realm. Disclaimer: Neither Dr. S. M. Davis nor Park Meadows Baptist Church of Lincoln, IL, offers any guarantee for the results of following the counsel offered in this document or in the messages offered by this ministry, nor do they accept responsibility for any negative outcome resulting from following the counsel offered by this ministry.